Nina gave up her life and her dreams of leaving Blackberry Island to give her younger sister Averil the chance to chase her own dream of being a journalist married to the wonderful Kevin. Ten years have passed and Nina is still on the island wondering what happened to her life. She’s the responsible one, still watching out for Bonnie, her irrepressible mother, and wondering why she gave up medical school to get Averil off the island if Averil has just returned home with a stray dog but no husband. Then, her ex who broke her heart returns to the island. But so does a younger man, now a hot-shot Naval pilot, who had a crush on Nina when he was 12 and she was 16. Life gets even more complicated when Nina’s mother purchases an odd lot from a storage company for her local antique store. One item has the potential to change Nina and her family’s lives. Evening Stars is the third of the Blackberry Island trilogy by Susan Mallery. The characters from book two Three Sisters, Deanna, Boston, and Andi, have supporting roles in Evening Stars, but this is Nina, Averil, and Bonnie’s book. I liked Nina’s character growth of feeling like she was the only responsible one in her family change into seeing that because she always stepped up, she allowed her mother to go on being irresponsible. And her fear is what kept her on the island, not her responsibilities. The story is a finely crafted tale of regret and fear and the mixed curse and blessing that is family. I really enjoyed it and highly recommend it! Disclaimer: I received a free copy of Evening Stars in return for a fair review. [Blank] is another winner from Susan May Warren! Deep plot, real characters, stellar writing. I loved [blank] and can’t wait for the next one. Seriously though, It Had To Be You is a very good book. Entry number two in Warren’s Christianson Family series is Eden Christianson’s story. We met her older brother, Darek, in Take a Chance on Me. Eden is a writer. She longs to be a reporter, breaking real news stories and covering events. Instead, she’s at the obits desk of the Minneapolis paper where she works. She’s spent her life on the sidelines, watching and cheering for her accomplished siblings. Especially Owen. Now she fills her days at the paper and her evenings are for watching her brother in his ice hockey games or dragging him out of bars to keep him safe. Jace (J-Hammer) Jacobsen is the team captain and Owen’s inspiration. His reputation as a violent enforcer has preceded him and Eden meets him feeling that she already knows him. When Owen has an accident on the ice, Eden is surprised to find that Jace is not quite the brute she’d believed him to be. It Had to Be You is a lovely story of how God takes our failures and mistakes and redeems them. Jace’s violent past is a part of who he is. Eden believes her gift is cheering on the others in her family. It’s thanks to Jace and a stranger in a coma that she discovers she’s so much more than a cheerleader to others’ accomplishments. The complexity of the characters and the interwoven plots are just part of what made this such a great book. Warren knows her characters on a cellular level. They never act in a way that rings untrue. The secondary plots are strong on their own and only add to the richness of the main storyline. Click here for some photos of how Susie sees the characters. I kept seeing Kristen Bell as Eden though, not Grace. And I totally see Tom Selleck as John and Bonnie Hunt as Ingrid. 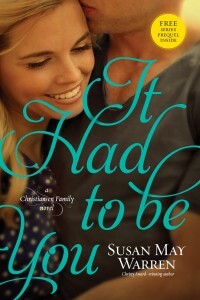 I loved It Had to Be You and I highly recommend it! I’m honored to be part of Susan May Warren’s launch team! I received a free copy of the book in exchange for an honest review. I heard someone say that they hate that saying: It’s all good. Because it’s not good. Life is hard. People will disappoint you. Nothing has been good since Eve ate the fruit and gave it to her husband. God said “It is good,” when He surveyed His creation work, but it’s been pretty much downhill ever since. I get what my friend was saying. But I find myself saying “It’s all good” a few times a week. Am I wrong about this? What does “It’s all good,” mean to you? I’ve been savoring this delightful devotional book written by my friend Kim Bagato. Dashes of Salt is a collection of short devotionals, designed to be read in just a few minutes but with a lasting impact that will follow you throughout your day. I read more daily devotionals than is probably good for me because they often become an exercise in ritual instead of something I read with intent. I never fell into the rote reading habit when I opened Dashes of Salt. The pieces are engaging, filled with transparent anecdotes from Kim’s own life. If you’re looking for a new devotional book or something to spice up your quiet time reading, you’ll find the perfect seasoning to your day in Dashes of Salt.